Many of you asked, so we tried to answer. 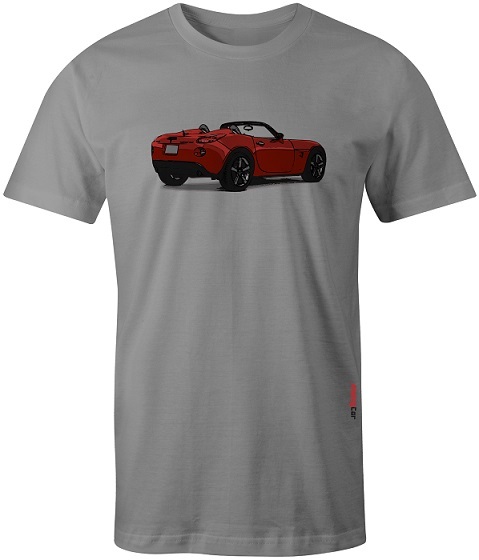 This week we have an Aggressive Red Solstice convertible t-shirt for sale! Long sleeve, hoodies, and youth tees are also available. Remember that the white coupe t-shirt will be gone Sunday night. Go to www.AnalogCar.com to check it out! Will you be doing a midnight blue solstice soon ? Sorry, that is not an option. If I were to print just one shirt with the print on the back instead of the front, our cost would be $40+. Again, I apologize but economies of scale are in play here. It's a losing proposition to alter the designs to taste. Thanks for the request, but you are the first one to ask for blue. Anyone else?? Red was the only color that got a significant amount of requests. Printing on the back would be a cool option... maybe with some kind of small logo on the front. Okay! Please go to checkout to see your total with shipping, and then login to your paypal account and send that amount to [email protected]. Put what type of shirt and what sizes you are ordering in the notes. If you have any questions, email [email protected]. Thanks! Does the red convertible mean that you could do a red coupe? Unfortunately we won't be doing anymore coupes in the near future because the white coupe (which ends today) has not sold as well as our other designs. The red solstice is still available until the end of the weekend. The next shirt is probably going to be a sky. Any requests on color for the sky? Isnt the purpose of Paypal makes it easier to buy? Costs too high? We had too many customer complaints about PayPal, so we removed them as an option at checkout. We can still use PayPal if the customer asks, but I listen to suggestions and complaints and take action where needed. Thanks!